Aviva Stadium Chooses Storagecraft to Keep the Drama on The Pitch! 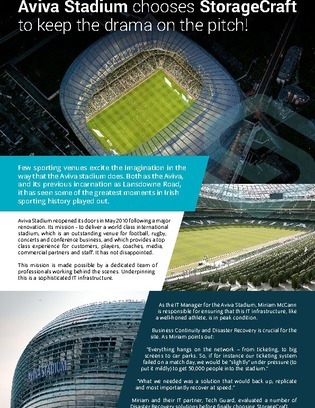 After a major renovation in 2010, Aviva Stadium recommitted themselves to providing one of the best sporting experiences in Ireland. A big part of that was ensuring business continuity, and fast recovery of data. Click inside to learn why Aviva chose the StorageCraft Disaster Recovery system, and everything they gained from it.